To make it in the natural world, some individuals need a little help. Organisms in ecosystems are interdependent, but some have formed more intimate associations, called symbiosis, to help them survive. For the lichen, a mutualistic or mutually beneficial partnership between a fungus and an alga or cyanobacterium -- some lichens include all three organisms -- the connection is so cozy, it has been named as a single organism. Fungi are decomposers, while algae and cyanobacteria, also misleadingly called blue-green algae, are photosynthetic producers. In their symbiotic relationship, each organism has something to offer the other(s). Fungal filaments, making up most of the lichen thallus, surround and harbor the algae, provide a stronghold, protect the algae from sunlight and dessication and absorb nutrients from the environment. Algae and cyanobacteria produce food and vitamins, and cyanobacteria produce amino acids from atmospheric nitrogen. In temperate forests, this combination of traits means lichens can colonize tree trunks, tree branches, dead wood, soil, bare rock and other nutrient-poor surfaces where few organisms can grow. Lichens require water, air, nutrients -- all of which they simply absorb through their thallus -- sunlight and a substrate. In temperate rainforests, where rain and/or fog are often abundant, ubiquitous lichens thrive on damp tree trunks and deadwood. Shrubby or hairlike fruticose, epiphytic lichens, including old man's beard, dangle from tree branches, drawing moisture from the air. Sensitive to toxins and pollution, lichens prefer clean air; most do not grow well near freeways or smog-spewing industries. Lichens also require sunlight for photosynthesis, although some varieties have adapted to dark forests. Found on almost any stationary surface, most lichens grow extremely slowly -- sometimes less than a millimeter per year -- and may be hundreds or thousands of years old. 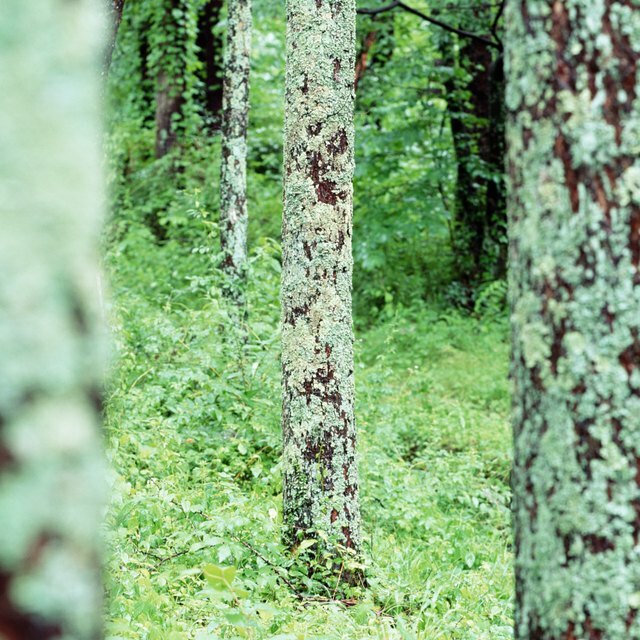 In temperate deciduous forests, lichens favor the north side of trees, perhaps to protect them from harsh weather. Clear-cutting, development and other disturbances that increase wind exposure, reduce humidity and remove old-growth trees and deadwood threaten many species of lichen. Lacking a plant's protective cuticle, lichens are poikilohydric: they dry out completely and go dormant, unable to photosynthesize, when water is scarce. Drying slowly to protect the algae/cyanobacteria, they can remain dormant at length, helping them survive droughts -- especially during summers in temperate coniferous forests -- and seasonal extremes of cold and heat. In this brittle state, pieces of thallus can break off, blow away and regenerate new lichens. When rain, dew or water vapor returns, lichens quickly absorb moisture -- up to 35 times their own weight -- and revive. In addition, lichens produce more than 500 biochemical compounds that help repel herbivores and competing plants, kill or deter attacking microbes and parasites and control light exposure. Lichens benefit temperate forests in a number of ways. As first colonizers in succession, lichens break down rock using enzymes and acids and, if growing in crevices, slowly wedge rocks apart through pressure and chemical action. The lichens then trap silt, dust, water and plant seeds, which germinate in these tiny, new patches of soil. 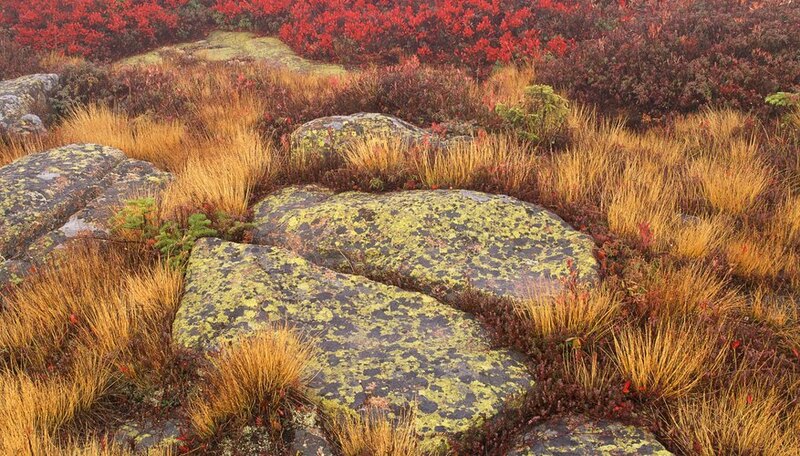 Slowly, more soil accumulates, and plants colonize where once only bare rock existed. Cyanobacteria in lichens, which turn nitrogen gas into biologically available compounds, enhance soil fertility when rain leaches nitrates from lichens, helping nitrogen-poor coniferous forests. Lobaria oregano, or “lettuce lichen,” is a major nitrogen source in old-growth forests of the Pacific Northwest. In addition, some temperate forest animals eat lichens, including flying squirrels and deer. Finally, as decomposers in the food web, lichens help recycle nutrients, serving a vital function in the temperate forest ecosystem. Norborg, Kari. "How Do Lichens Adapt to the Temperate Forest?" Sciencing, https://sciencing.com/lichens-adapt-temperate-forest-12325770.html. 25 April 2017.